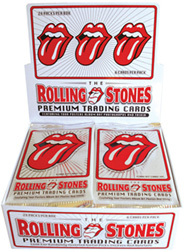 One full box of factory sealed Rolling Stones premium trading cards featuring classic tour posters, album covers, rare photographs and trivia spanning over 40 years of rock and roll history. Ninety-nine (99) card uncut press sheet featuring an array of Rolling Stones photographs from the band's early London years to their electrifying A Bigger Bang World Tour. 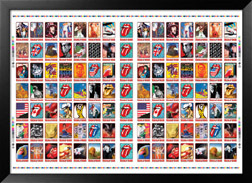 One hundred (100) card uncut press sheet featuring a combination of Rolling Stones tour posters, album covers and photos. Forty-nine (49) card mini edition press sheet featuring Rolling Stones tour posters, album covers and classic tongue art. 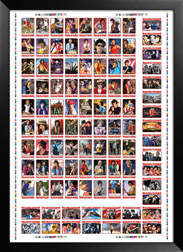 One hundred five (105) card uncut press sheet featuring a colorful mix of Rolling Stones tour posters, album covers and classic tongue art. 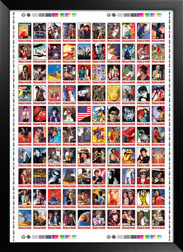 One hundred five (105) card uncut press sheet featuring a colorful mix of Rolling Stones tour posters, album covers and holographic classic tongue art. 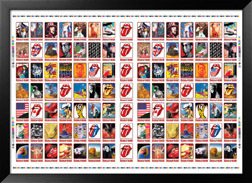 Forty-nine (49) card mini edition press sheet featuring Rolling Stones tour posters, album covers and holographic classic tongue art. 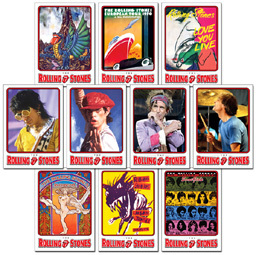 The complete seven piece collection of Rolling Stones uncut trading card sheets including a previously unreleased lipstick red foil variant.